Two kilometres north of Teslin is the Teslin River Bridge that spans the Teslin River – a major Yukon river. The 446.95 m (1,466.4 foot) long cantilever bridge is the only original (PRA construction) steel bridge left on the southern Yukon stretch of the Alaska Highway. Located about halfway between Watson Lake and Whitehorse, the bridge took two years to build, opening in 1944. It is the third longest water span on the highway. 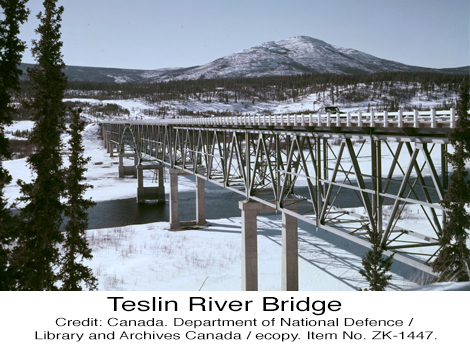 Often confused with the nearby Nisutlin Bay Bridge, the Teslin River Bridge has an elegant design: one vertical arch in the middle of the span with truss segments on either side that were built below, rather than above, the bridge roadbed. Set against a picturesque landscape of steep, rocky river banks, conifer forests, low hills and mountains beyond, the bridge has a stunning simplicity. The area has been inhabited by the Inland Tlingit First Nation since the 19th century, where they hunted and trapped, following the seasonal migration of fish and game. Long before the Alaska Highway was built, the Teslin River was an important water route for Aboriginal peoples and traders. During the Klondike Gold Rush, the river was a significant part of the all-Canadian route into the gold fields. In 2005, the bridge’s roadbed was replaced and widened and other structural elements were strengthened to guarantee a much longer life for this distinctive structure.